This topic has 42 replies, 20 voices, and was last updated 2 years ago by wilburt. Garmin have just released the new Garmin 520 GPS ( https://buy.garmin.com/en-GB/GB/sports-recreation/cycling/edge-520/prod166370.html ) and I thought it might be helpful to other STW’s to post some of my findings regarding mapping on this unit (via web research piecing together how-to’s and the best options I could find). First thing to note is that the Garmin 520 won’t search and plan a route for you by finding the best route along roads like a car SatNav would and like the Garmin 810/1000 will. If you are a roady and specifically want road navigation the 810/1000 are probably better choices for you. However, as a Mountain Biker I don’t need that functionality, as I typically want to load a prewritten course (eg a .GPX file) and then follow that off-road course on the GPS screen. You don’t absolutely need a map on screen, to be able to follow a GPS course in this way. But it makes for far easier navigation if you can see your GPX course superimposed on a decent map, which gives some context to your route…this is where this post comes into play. The Garmin 520 doesn’t have a micro-SD card slot for storing map data like the 800/810/1000 units, which at first glance may make it seem a bit of a non-starter for the 520 displaying decent maps or sensible map coverage. However it does have some internal memory, which can be used to store map data and it does have a good colour display screen. By removing the standard (and totally useless) world basemap from the 520, this then frees up approx. 110MB of internal memory space, which can be used to store a far better and more useful map of a smaller area. I’ve always liked OS Discoverer maps, but the GPS versions are very expensive, large in terms of file size and also they tend to look blurry as you zoom in. A better choice I found was to use a map from http://talkytoaster.co.uk which gives a similar look and feel to a OS map, complete with contour lines and features, but at a fraction of the size and cost, as well as being raster-based, so very clear when zooming in. This site provides some free UK mapping, but I recommend paying £20 for the subscription service, which gives really nice maps that are up to date and look great. Now you can’t just load the whole UK mapping on a 520 due to the 110MB memory limit, but I found I could easily load a Talkytoaster map of the whole of North of England, from the Scottish borders south-wards, including the Peak district and that would use about 85MB memory (you also need to leave some room for other garmin route/activity/segment files, so best limit the map data to around 90MB). For my MTB purposes that is a big enough map area for me and since I can swap the map file out for another area (say the whole of Scotland) in circa 10 minutes with my computer, this isn’t really a limitation. Step 1 – Once you have a 520, buy and download the map you need from Talkytoaster.co.uk onto your PC or Mac (make sure you get the Basecamp version of the map, for PC or for Mac depending on what type of computer you are using). Step 2 – Download and install Garmin Basecamp for PC or Mac. This will load several programs onto your computer. Step 3 – Double click on the map file you downloaded in step 1 and it will run the Garmin Mapmanager program and install the map file you downloaded from talkytoaster onto your computer. Step 4 – Now plug your 520 into the USB port on your computer and using file explorer or finder, look at the GARMIN folder on the 520. You will see a file called gmapbmap.img this is the (useless) basemap that comes as standard with the 520. Copy this file and make a backup of it on your computer for future safekeeping and then delete it from the 520. This will now give you approx. 110MB free memory. Step 5 – Make sure your 520 is still plugged in to your computer and and then run the Garmin Mapinstall program. Select the talkytoaster map in the mapinstall pulldown menu on the first page and click continue. On the next page you will see the various map tiles that the overall UK map is made up from. If you can’t see them fully, use the zoom in control until you can. Select the map tiles that represent the map area that you want to have on your 520, bearing in mind that you want to select no more than approx. 90MB of mapping (helpfully it shows the amount of map data you are selecting at the bottom of the screen). When you have finished choosing the map tiles you want select ‘send maps’ then ‘continue’ on the next page and the program will then install a file onto your Garmin. This may take some time, be patient. Step 6 – Disconnect your 520 from your computer, turn the 520 off and back on again and you should now have good quality UK mapping! Cheers mate, very useful info there as I’ve just ordered the 520. How do the Talkytoaster maps compare to the OSM ones? Is it possible to move the map around the screen to look around an area? I don’t think so. I think you can only zoom in/out of your present location. That seemed the likely answer – thank you for confirming! Not found a way around it yet. Anyone else had the same issue? Step 5 – Make sure your 520 is still plugged in to your computer and and then run the Garmin Mapinstall program. I get stuck here. Can do the free dcrainmaker version but trying to load up the talkytoaster maps gets stuck here. I can see them in Basecamp but it doesn’t recognise my 520. thats using the garmin cable as well. Does your 520 install as a mass storage device and/or a com port? Mine only installs a storage device which could be why it can’t be found by mapinstall. I’ll try it on another PC tomorrow. Just sent you an email – suggest you try this. As a workaround – You can use a USB stick to save the map onto from the mapinstall program, instead of trying to put it directly onto the 520. To do this get a USB stick and create a folder on it called GARMIN. Plug this USB stick into your PC, leaving the 520 disconnected. Then open up the mapinstall program and select the map area you require and then load the map onto the USB stick. Next manually copy the map file off the USB stick onto the GARMIN folder on the 520. Rename the file as per original thread above and turn 520 off and back on and all should be ok.
loading onto a USB key and then transferring across has worked. Thanks. Sorted. Missed a couple of tiles first time round. ~50mb to cover most of the SW. Worked for me also, downloaded the map tiles from openstreetmap and dropped the file into the garmin folder and changed the file name and it worked. Have the shiny new 520. Have the maps from TalkyToaster (the British Isles Contours NON Routable TT50 GMAPSUPP map). I’ve downloaded it, extracted it from the .zip and it is a .img file, 618MB. I’ve also installed BaseCamp – which recognises the 520. Beano68 – the file downloaded from TalkyToaster is 618MB. So I was expecting to be able to load it into BaseCamp and then select the areas I want. Got it! MapInstall didn’t work on either the Mac or Windows PC with the Garmin device. Turns out the USB trick works a treat and I now have the TT maps installed on the 520. Like AndrewBF I am stumped at Step 3 – Double click on the map file you downloaded in step 1 and it will run the Garmin Mapmanager program and install the map file you downloaded from talkytoaster onto your computer. I looked at jam bo’s comment, but the only obvious file “lower down” for PCs is: “Mapsets For Use With PC ONLY (MapSource or BaseCamp)” This downloads a 558MB zip file full of img files. Talkytoaster’s website provides absolutely no suggestions at this stage. Can anybody who has done this help? I am using Windows 7. Download that one. Import it into base camp, export the tiles you want from base camp using map manager. This is the step that I couldn’t do directly onto my 520 but could do it onto a USB key with a garmin folder and then copy it across. jam bo – thanks for the reply. How do I import it? If I use the Basecamp option: File/Import into my collection, it only seems to recognise a limited range of file types, such as fit, gdb, gpx . . . but not img or zip. I think I unzipped it into a folder and then imported from there. Reading this post with interest as I’m pondering getting a 520. Makes me think, why on earth is it this complicated?! Why can’t you buy something, turn it on and start riding?! This reminds me of a module called remote sensing I did 10 years ago at university and I was rubbish at it. You can. But the built in garmin map is rubbish. Thinking of getting a 520 but just got a few map questions. …. Does the 520 do routable maps? 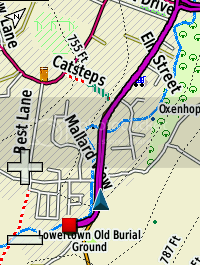 Do the newer OS 1:50k look maps on the talkytoaster website work on the 520, or do I have to stick with the older ones? Picking one up from Halfords today, tick! I use the open street mapping @meeeee… You can get about 50mb of fairly detailed mapping for a reasonable area with that. Hello. This may be a daft question. I have followed the steps above but when i load the map it does not look like the above. I have a blue background, not sure how to upload pics as this is first time i have posted. Thanks for the great thread btw. Do the open street maps or talky toaster ones have contours on? Could anyone post a screen shot of maps they use? Some devices were found; However none have the necessary capabilties… You may need to set the interface option to ‘Garmin or ‘Host’. In fact, when I run MapInstall the first thing the program asks me is to select the device where I’ll install maps. My only option is to click on the find device button, and I get the above message. It seems I can’t go to the next screen unless I select a valid device. And my Edge 520 isn’t recognised as a valid one! The weird thing is that BaseCamp sees my device. When I run BaseCamp, my Edge 520 is listed on the left pane, and it also shows the unit ID. It also shows my activities on the map. My BaseCamp version is 4.6.2. The software on my Edge 520 is up to date. I can’t find a way to avoid this issue. I looked for some sort of interface option on the device, but couldn’t find any. For future reference, here’s what I did. The argument of family-id is a 4-digit number. You take that id from the first 4 digits of the filenames of the 6*.img files you’re merging. The topic ‘Garmin 520 mapping’ is closed to new replies.